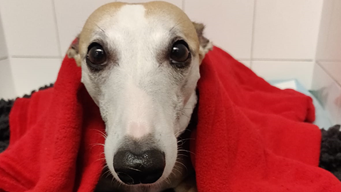 Willa, an 8-year-old female neutered whippet presented to Lumbry Park’s Emergency and Critical Care Service with a history of vomiting, pyrexia and anorexia of several days’ duration. 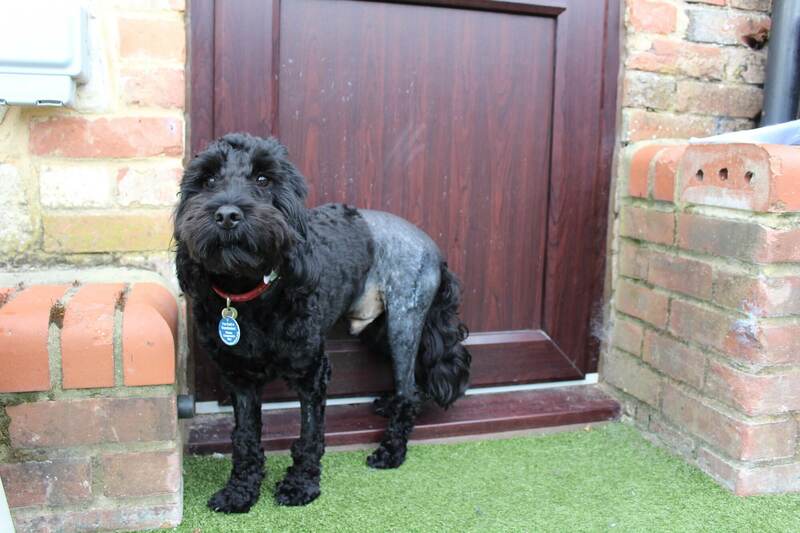 Willa had been treated previously for steroid responsive meningitis arteritis and immune mediated polyarthritis which had been managed medically with low doses of prednisolone. On presentation, Willa was tachycardic with hyperdynamic pulses, she demonstrated severe pain on cranial abdominal palpation which also elicited signs of nausea. Haematology revealed a mild elevation in PCV (PCV 64%, total solids 92g/l) and a mild neutrophilia (13.4 x 109/L, RI 3.5-12). Biochemistry demonstrated severely elevated ALP (758 U/L, RI 12-83) and moderately elevated ALT (280 U/L, RI 13-78). Coagulation times were normal. 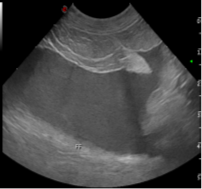 Abdominal ultrasonography revealed increased hepatic echogenicity and free fluid (figure 1). 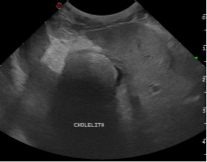 A large cholelith was present within the gall bladder (figure 1) whilst the cranial pole of the gall bladder was discontinuous. An aspirate of free abdominal fluid was obtained and sent externally for cytology, culture and sensitivity. The fluid was cloudy and greenish in colour. 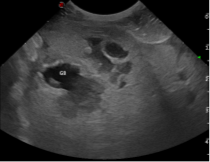 Figure 3: The cranial pole of the gall bladder was discontinuous consistent with gall bladder rupture. 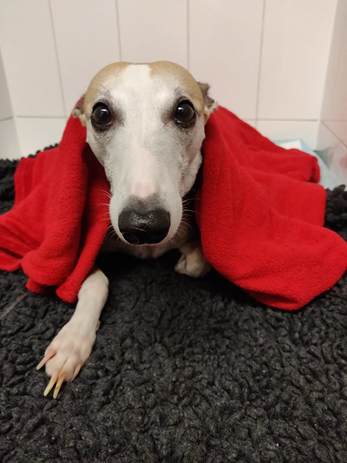 Willa was swiftly taken to surgery where an exploratory laparotomy was performed, confirming the presence of free biliary fluid within the abdomen and rupture of the gall bladder was evident. Cholecystectomy was performed along with duodenotomy to catheterise the common bile duct via the duodenal papilla to ensure its patency. Liver biopsies were obtained and submitted for histopathology and culture in addition to resected gall bladder tissue. Extensive abdominal lavage was performed prior to routine abdominal closure. An oesophagostomy feeding tube was placed along with a central venous catheter prior to recovery. Medical management was initiated for suspected septic bile peritonitis (later confirmed by culture of E.coli and Enterococcus species). Intravenous fluid therapy at 4ml/kg/hr was administered alongside constant rate infusions of lidocaine and fentanyl for analgesia. Intravenous enrofloxacin and amoxycillin clavulanate were administered with amoxycillin clavulanate withdrawn once culture results were received. Treatment with anti-emetics and prokinetics were initiated in the form of a metoclopramide CRI, intravenous maropitant, oral erythromycin and ondansetron. Willa was managed intensively for five days following surgery. 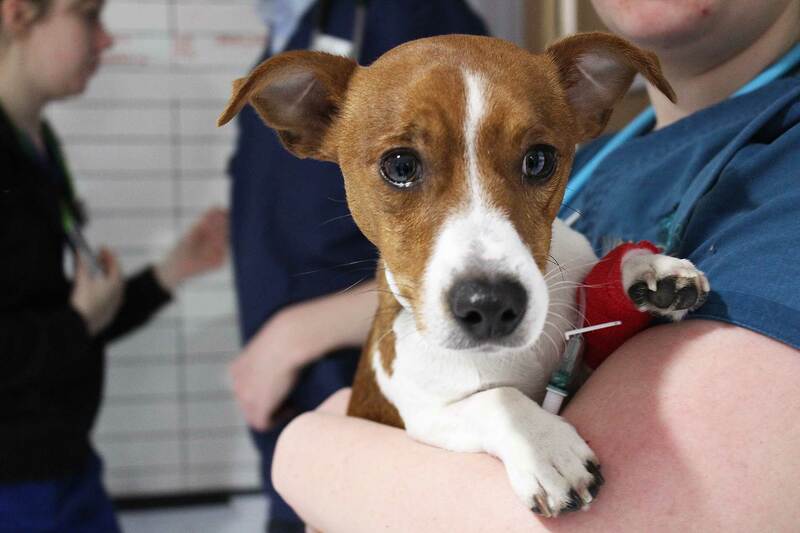 Although the prognosis for Willa was deemed initially poor, her response to treatment was remarkable. Constant rate infusions were de-escalated as she continually improved. Supplementary feeding was provided via the oesophagostomy tube until spontaneous appetite returned. She was transferred to oral medications including 6 weeks of enrofloxacin with ursodeoxycholic acid and s-adenysylmethionine long-term. 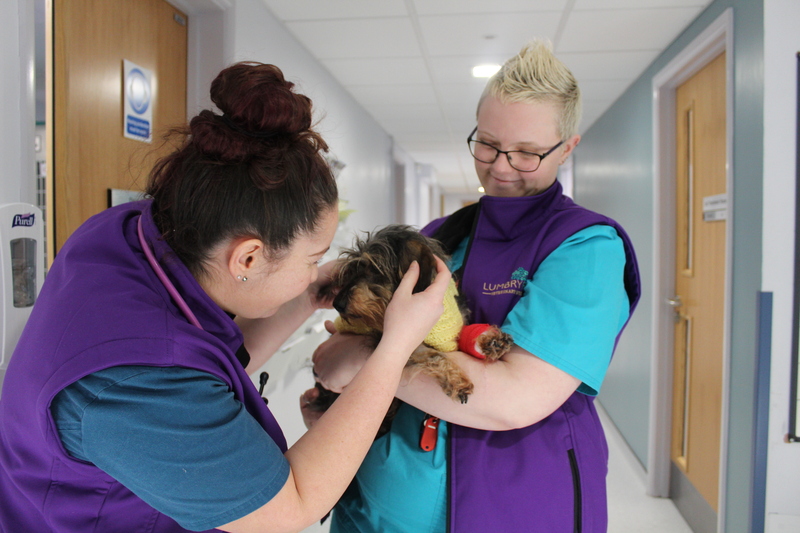 Despite the severity of Willa’s condition and guarded outlook initially, staff at Lumbry Park were ecstatic to be able to get her happily home to spend the festive period with her owners and brother, Dash!